Contemporary worship music (CWM), also known as praise and worship music, is a loosely defined genre of Christian music used in contemporary worship. It has developed over the past sixty years and is stylistically similar to pop music. The songs are frequently referred to as "praise songs" or "worship songs" and are typically led by a "worship band" or "praise team", with either a guitarist or pianist leading. It is becoming a common genre of music sung in Western churches, particularly in Pentecostal churches. Many non-charismatic Protestant churches use this type of music. Also, Roman Catholic churches are using this type of music in some parishes. Some mix it in with more traditional music; others have certain masses with just contemporary worship music along with traditional masses; others only use contemporary; many others steer clear of contemporary worship and stick with traditional. In the mid-20th century, Christian Unions in university environments hosted evangelistic talks and provided biblical teaching for their members, Christian cafes opened with evangelistic aims, and church youth groups were set up. Amateur musicians from these groups began playing Christian music in a popular idiom. Some Christians felt that the Church needed to break from its stereotype as being structured, formal and dull to appeal to the younger generation. By borrowing the conventions of popular music, the antithesis of this stereotype, the Church restated the claims of the Bible through Christian lyrics, and thus sent the message that Christianity was not outdated or irrelevant. The Joystrings were one of the first Christian pop groups to appear on television, in Salvation Army uniform, playing Christian beat music. As of the early 1990s, songs such as "Lord, I Lift Your Name on High", "Shine, Jesus, Shine" and "Shout to the Lord" had been accepted in many churches. Integrity Media, Maranatha! Music and Vineyard were already publishing newer styles of music. Supporters of traditional worship hoped the newer styles were a fad, while younger people cited Psalms 96:1, "Sing to the Lord a new song". Prior to the late 1990s, many felt Sunday morning was a time for hymns, and young people could have their music on the other six days. A "modern worship renaissance" helped make it clear any musical style was acceptable if true believers were using it to praise God. The changes resulted from the Cutting Edge recordings by the band Delirious?, the Passion Conferences and their music, the Exodus project of Michael W. Smith, and the band Sonicflood. Contemporary worship music became an integral part of Contemporary Christian music. More recently songs are displayed using projectors on screens at the front of the church, and this has enabled greater physical freedom, and a faster rate of turnover in the material being sung. Important propagators of CWM today include Hillsong, Vineyard, Bethel Music and Soul Survivor. As CWM is closely related to the charismatic movement, the lyrics and even some musical features reflect its theology. In particular the charismatic movement is characterised by its emphasis on the Holy Spirit, personal encounter and relationship with God, and agape. The metaphorical language of the lyrics is subjective, and therefore does risk being misinterpreted; this emphasis on personal encounter with God does not always balance with intellectual understanding. Just as in secular popular and rock relationships and feelings are central topics, so in CWM association to a personal relationship with God and free expression are emphasised. As in traditional hymnody, some images, such as captivity and freedom, life and death, romance, power and sacrifice, are employed to facilitate relationship with God. Because, in common with hymns, such music is sung communally, there can be a practical and theological emphasis on its accessibility, to enable every member of the congregation to participate in a corporate act of worship. This often manifests in simple, easy-to-pick-up melodies in a mid-vocal range; repetition; familiar chord progressions and a restricted harmonic palette. Unlike hymns, the music notation may primarily be based around the chords, with the keyboard score being secondary. This sound clip is a recent example of CWM and demonstrates the variety available within these boundaries: Strength will rise (Everlasting God). With the exception of one 2/4 bar shortly before the chorus, rhythmic variety is achieved by syncopation, most notably in the short section leading into the chorus, and in flowing one line into the next. The use of a pedal note at the opening secures the piece firmly in B flat major, and the whole piece uses only four chords: B flat (tonic), E flat (subdominant) and G minor (submediant), and just two references to F (dominant) as it leads into the chorus. Structurally, the form verse-chorus is adopted, each using repetition. In particular the use of a rising four-note figure, used in both melody and accompaniment, makes the song easy to learn. At more charismatic services, members of the congregation may harmonise freely during worship songs, perhaps singing in tongues (see glossolalia), and the worship leader seeks to be 'led by the Holy Spirit'. There may also be role of improvisation, flowing from one song to the next and inserting musical material from one song into another. There is no fixed band set-up for playing CWM, but most have a lead singer and lead guitarist or keyboard player. Their role is to indicate the tone, structure, pace and volume of the worship songs, and perhaps even construct the order or content of the worship during performance. 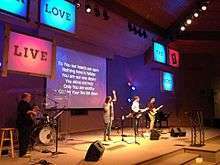 Some larger churches are able to employ paid worship leaders, and some have attained fame by worship leading, blurring contemporary worship music with Christian rock, though the role of the band in a worship service, leading and enabling the congregation in praise normally contrasts that of performing a Christian concert. In CWM today there will often be three or four singers with microphones, a drum kit, a bass guitar, one or two guitars, keyboard and possibly other, more orchestral instruments, such as a flute or violin. There has been a shift within the genre towards using amplified instruments and voices, again paralleling popular music, though some churches play the same songs with simpler or acoustic instrumentation. Technological advances have played a significant role in the development of CWM. In particular the use of projectors means that the song repertoire of a church is not restricted to those in a song book. Songs and styles go in trends. The internet has increased accessibility, enabling anyone to see lyrics and guitar chords for many worship songs, and download MP3 tracks. This has also played a part in the globalisation of much CWM. Some churches, such as Hillsong , Bethel Music and Vineyard, have their own publishing companies, and there is a thriving Christian music business which parallels that of the secular world, with recording studios, music books, CDs, MP3 downloads and other merchandise. The consumer culture surrounding CWM has prompted both criticism and praise, and as Pete Ward deals with in his book "Selling Worship", no advance is without both positive and negative repercussions. Samuele Bacchiocchi expresses concerns over the use of the "rock" idiom, as he argues that music communicates on a subconscious level, and the often anarchistic, nihilistic ethos of rock stands against Christian culture. Using the physical response induced by drums in a worship context as evidence that rock takes peoples' minds away from contemplating on the lyrics and God, he suggests that rock is actively dangerous for the Church. Some songs now appear in more traditional hymnals. Evangelical Lutheran Worship (published in 2006 by the Evangelical Lutheran Church in America) includes "Lord, I Lift Your Name on High" by Rick Founds and "Shout to the Lord" by Darlene Zschech. The United Methodist Hymnal (1989) includes "Thy Word Is a Lamp" by Amy Grant and "Take Our Bread" by Joe Wise. Contemporary Christian worship groups such as Hillsong United and Bethel Music are growing in mainstream popularity. Modern worship bands are now ranking as high as No. 1 and No. 2 overall for both Billboard and iTunes charts and are earning publicity in pop culture publications (Cosmopolitan). ↑ "Hymnology: Praise and Worship Music". smithcreekmusic.com. ↑ Breimeier, Russ (2008-07-29). "Modern Worship Is Going Nowhere". Christianity Today. Retrieved 2015-10-31. 1 2 Ward, Pete (2005). Selling Worship: How what we sing has changed the church. Authentic Media. ISBN 978-1-84227-270-1. ↑ Parrett, Gary, A. (2005-01-28). "Theses on Worship: A disputation on the role of music". Christianity Today. Retrieved 2013-04-22. ↑ Lee, David (1998). "How long, O Lord, will we forget?". Retrieved 2010-08-16. ↑ Vasey, Michael (1986). Reading the Bible at the Eucharist. Grove Books. ISBN 1-85174-018-X. ↑ Hakim, Naji (2003). "Music in the Catholic liturgy in France at the end of the 20th century". Retrieved 2010-08-16. ↑ Moring, Mark (March 2011). "Pop Goes the Worship". Christianity Today: 22–25. 1 2 Gordon, T. David (October 27, 2014). "The Imminent Decline of Contemporary Worship Music: Eight Reasons". Second Nature. ↑ 'Lord I Lift Your Name on High', Rick Founds, copyright 1989 Maranatha Praise, Inc.
↑ 'Take Our Bread', Joe Wise, copyright 1966 by Joe Wise, used in the United Methodist Hymnal by permission of G.I.A. Publications, Inc.